^ Young Bryan siblings are finding success in Hollywood - The Eagle: Brazos Life. The Eagle. [2013-11-14]. （原始内容存档于2013-02-04）. ^ Rico Rodriguez Congratulates His Sister Raini Rodriguez For Her Role In Disney’s "PROM" Movie Disney Dreaming. DisneyDreaming.com. [19 December 2010]. （原始内容存档于2014-10-19）. ^ Rico Rodriguez. The Hollywood Reporter. 2012-09-20 [2013-11-14]. ^ Macatee, Rebecca. Rico Rodriguez: I'm Nothing Like Manny on 'Modern Family'. PopEater. 8 December 2010 [20 December 2010]. ^ Television - Modern Family. The New York Times. December 2013 [9 December 2013]. 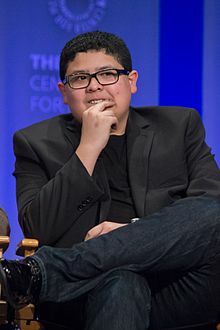 ^ ‘Modern Family’ Star Rico Rodriguez Spills TV Secrets, Life Lessons in New Book. ABC News. 20 November 2012 [9 December 2013]. ^ Hopewell, John. ‘El Americano 3D’ Kicks Off Pre-Sales at Cannes (EXCLUSIVE). Variety (magazine). 20 May 2014 [21 May 2014].